One of my favourite analogies when thinking about self-confidence is that of the swan. A swan glides on the surface of the pond, looking calm and in control. Yet underneath the water it’s a different story; feet frantically paddling away! 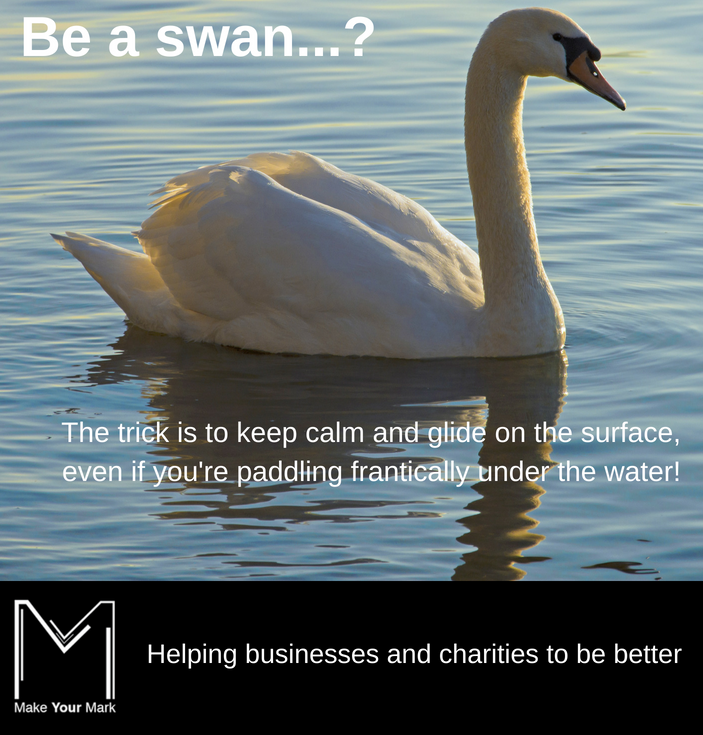 This is particularly the case when you are a start-up business or perhaps new to managing a charity – you want to give the air of being calm and collected, confident and competent to the outside world, even if you feel like you’re splashing about and not really sure what you’re doing! That feeling is totally normal you will be pleased to hear! The trick is to ‘fake it ’til you make it’ as the saying goes. So what? One of the key things to master is being able to accept that you will often feel like you are paddling away. You may find yourself asking, ‘What am I doing?’ and ‘what do I know?’ If you can hold your nerve and cope with these normal self-doubts, you are more likely to come out on the other side! It can be so easy to be full of self-doubt and forget how much you may know or how skilled you actually are – and how you could use your skills to help others. People will be willing to buy your expertise! Whether you are selling a product or service, seek comments about how satisfied your customers or clients are with what you have done or provided. When asking delegates on my training courses to complete an evaluation form, I always ask what aspect they find least useful as well as what have they learned. This can then be used to tweak your content and also help recognise the value people got from your service. 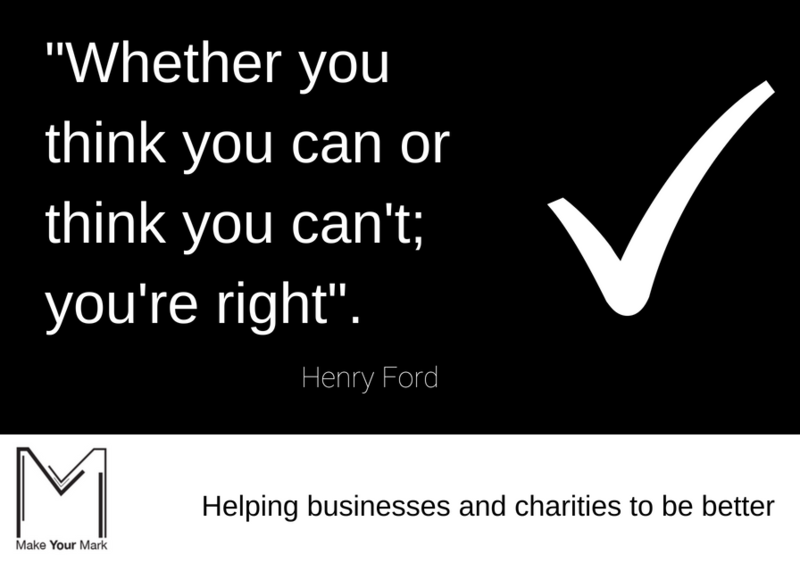 Why not have some positive affirmations or inspiring quotes and messages around your work place, desk or at home that can encourage you to keep a positive mindset – even on a challenging or bad day! 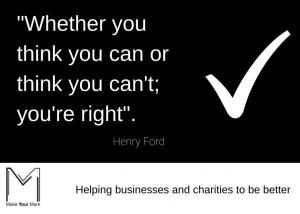 I find it really helpful to look at the above Henry Ford quote that I have on my desk! When you are running your own business and particularly if you are a sole trader or small in number, it can feel quite isolating. Being left with your own thoughts on a regular basis, especially if you are having a challenging time, can be extremely difficult. You don’t want to get stuck on a downward spiral of negativity, fear and worry! Seek a mentor – for example I’ve just started as a mentor with the SCR (Sheffield City Region) Launchpad Mentoring scheme. A mentor can be a bit like a mirror; they won’t tell you what to do but can help you see things in a different way. Every morning a friend and I send each other a whats app message with three things we are grateful for which happened the previous day. Even on challenging days, you can always find something that went well. It also helps you keep connected to your friends! Try and avoid or withdraw from people who are negative. I’m sure we all know someone who constantly moans, always sees the glass half empty and who can be quite a drain on our positivity. If you are not careful, they will have an impact on you too! Instead, spend time with others who are positive and upbeat. Which of these tips do you think work best for you? Have you found something else that keep you in a positive mindset? I always love hearing Mark speak! So much energy and this blog is a wonderful snippet of his neverending positivity!! I feel uplifted and ready for my day after reading your blog! Love it! What’s Happening i am new to this, I stumbled upon this I have discovered It absolutely useful and it has aided me out loads. I hope to contribute & help other users like its aided me. Good job. I used to be recommended this blog through my cousin. I am now not positive whether this publish is written by him as no one else recognise such distinct about my difficulty. You’re amazing! Thank you! I’m commenting to let you know what a awesome discovery my cousin’s princess had reading through your site. She came to understand a lot of issues, which include what it’s like to possess a great helping nature to make the mediocre ones very easily understand certain grueling subject matter. You undoubtedly exceeded our own desires. Many thanks for churning out the important, trustworthy, informative and in addition easy tips on that topic to Gloria.